November 11, 2016 By Chris Freytag & filed under Blog. Let me know if this sounds familiar: you have the best of intentions when it comes to working out, but when your alarm actually goes off and your day begins, those best intentions go out the window. Emails, appointments, and other obligations all get in the way and before you know it, another day has gone by without a workout. The truth is, most of us are busy enough that we could choose to do a million other things aside from working out. So what’s the difference between people who plan to work out and those who actually DO? 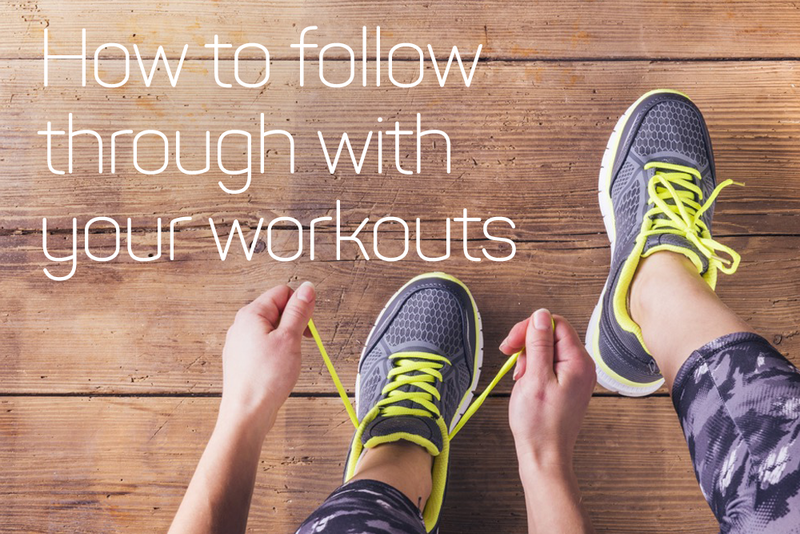 We’re going to break down the four things that will help you actually follow through with your workouts—even when you REALLY don’t feel like it. The number one way to ensure you follow through with your workout is knowing WHY you want to do it in the first place. We all have endless responsibilities – things we “should” do. Don’t let working out just become one of those things. Think of why you want to exercise. Is it for your health? To lose the last ten pounds? To simply have more energy to tackle the rest of your day? Whatever your WHY is, don’t forget it! Write it down and keep it in a place you will see every day; on your mirror, by your alarm clock, or in the car. Poor time management is practically an epidemic. Think of how many people complain that they’re super busy, yet don’t seem to get anything done. We all have the same 24 hours in a day, so it’s up to you how you handle everything on your plate. The best way to tackle tasks? Bundle them. Bundle your email so you only check it two to three times per day. Bundle your chores so you get more done at once. This frees up more of your time to fit in a workout each day. Now that you’ve found more time to exercise by managing your time, make your workout an appointment you can’t break by writing it in your planner or adding it to your phone calendar. Lay out your workout clothes the night before, pack a snack, have everything all set to go so that when it’s time to workout you have NO excuses. Whether you work out at 7am or 7pm, schedule that time in your calendar and then stick to it like you would any other important meeting. But it’s not just enough to schedule your workouts; you need to also be held accountable. The reason so many people ditch their workouts, even if they’ve scheduled them, is that they only have to report back to themselves. TELL someone your workout plan—have a trusted buddy or confidante help keep you accountable. Join our Get Healthy U TV Facebook Group for Members—we keep each other accountable and encourage one another along the way! What are you tips for following through with your workouts? Let us know in the comments! When I get home from work I take a 30 minute break which usually consists of a nap. Once 30 minutes is up I change into my workout gear and go to my exercise space and begin – once finished my workout then I’m ready to make dinner and enjoy the rest of my day. I work from home, so once I get everyone out of the house in the morning – which is around usually 8am, I put on my workout clothes and get to it. Before hand, usually when I first wake up, I check out Get Healthy U on FaceBook to see what exercise is on for the day. I will watch it so I know the moves before hand and can then really focus on the workout when it’s time. If it isn’t one I’m particularly “feeling” that day, I go back to the archived ones or one that I really enjoyed in the past and do it. So far it’s working. I’ve only missed a few days since I started my health and fitness journey on Oct. 31st. Thanks Get Healthy U! To follow through I either do my route first thing in the morning before my day interferes OR after dinner when it’s cooler. I have a friend who holds me accountable too. I think it’s key to have at least one person. Yes – my friend and I have committed to a 30 day challenge together. We email each other with progress reports as I am in Europe and she is in CA. It helps keep us honest.